Cook the delicate hake fillets in a non-stick frying pan so the skin doesn’t stick to the base. 1. Tip the bulgar wheat into a bowl and pour over enough boiling water (about 150ml) to cover; set aside to stand for at least 10 minutes. 2. Meanwhile, season the fish. Heat 1 tbsp oil in a frying pan set over a medium heat. Carefully lay the fish, skin-side down, in the pan and cook for 2-3 minutes, until golden. Turn the fillets over and cook for another 2-3 minutes. When you think they’re done, take a small knife or a cocktail stick and gently push through the flesh. If there is no resistance, the fish is cooked, if it proves difficult, continue cooking. 3. 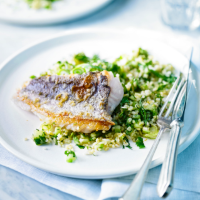 Fluff the bulgar wheat with a fork and toss with the remaining 1 tbsp oil and other ingredients; season and serve with the hake. This recipe was first published in Wed Apr 01 15:39:00 BST 2015.